One of the magic things about Christmas is the build up to Christmas Day. We use an advent calendar to help us count down the days. It’s become one of our Christmas traditions! 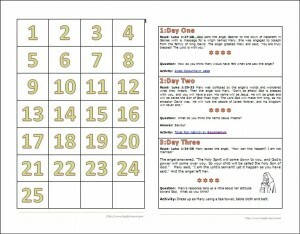 Last year, I created an easy Christmas Advent Calendar and I’m doing it again for 2011. Keeping in line with my neutral/red theme, I’ve gone with a paper box Christmas Tree Advent Calendar. It’s very easy to make (took me 30 minutes). 1. 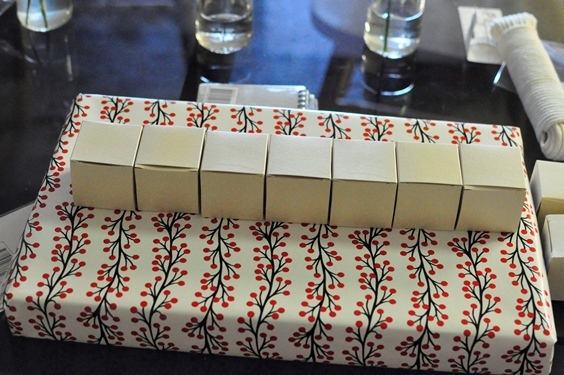 Wrap the box, wood or cardboard in wrapping paper of your choice. This makes the base of the Christmas Tree Box Advent Calendar. 2. Glue down 7 boxes to the base as shown below. Keep in mind you will need to open the boxes from the front. 3. Repeat with a layer of 6 boxes. Then 5, 4 and finally 3. 4. Label each box with a number, 1 – 25. Numbers can be random, so the kids have to hunt for the right one, or in sequence (as I have done). I used a permanent marker to draw the numbers on each box; you can buy number stickers or use scrapbooking techniques to make it look neater (and prettier). 5. Glue the decoration on top. I purchased the delightful paper angel from Veronica from Phoenix Trading. 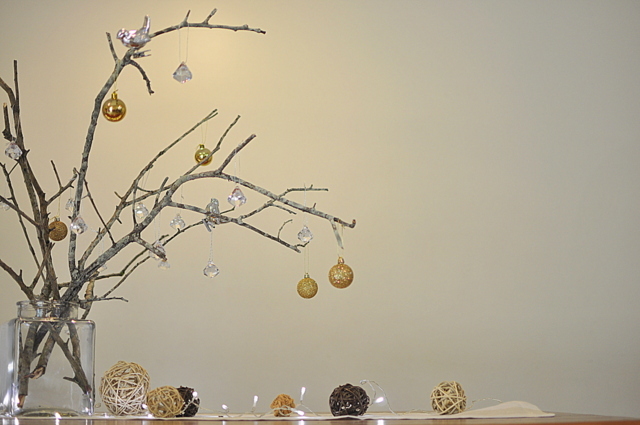 You can use another light decoration like a Paper Plate Angel, star or pom pom instead. 6. Fill each box with notes/treats. 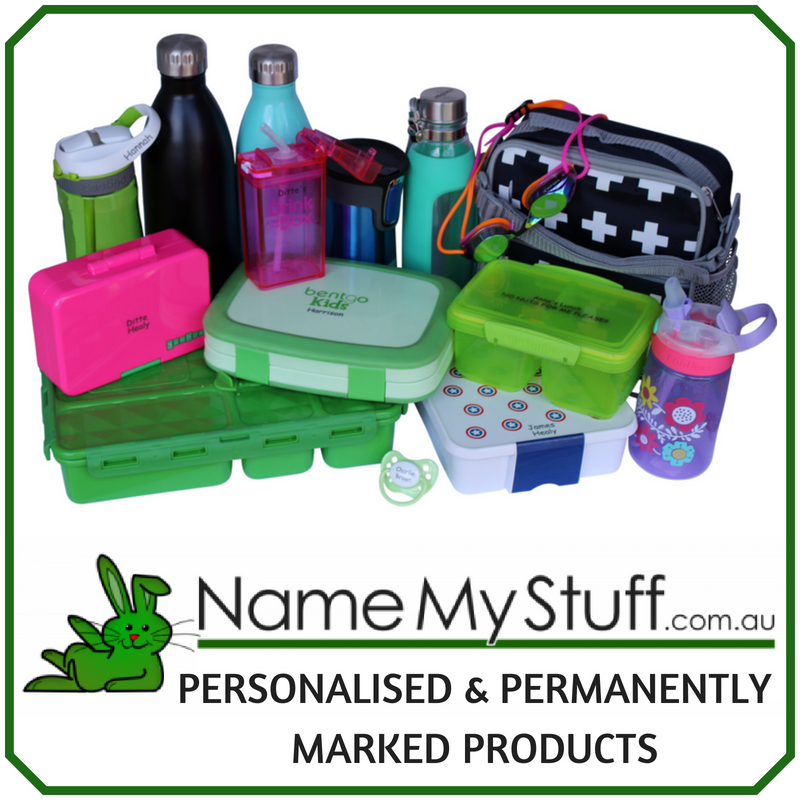 Ready made gift boxes are sold in packs at discount and craft stores like Spotlight (they are very affordable). If you would rather do your own, feel free to print these templates on cardstock. As we open the Christmas Advent Calendar, our family will be following along with the Christmas Story, and doing a short activity each day. If you want to follow along too, you can print the PDF file below. It’s filled with short readings and activities broken down into 25 days. I cut each day’s story out and put it inside the box with a special treat. 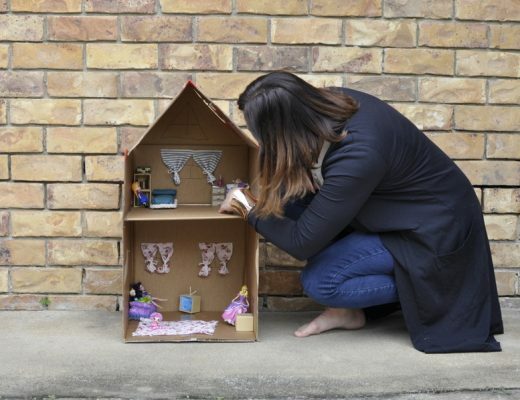 Does your family use a Christmas Advent Calendar? 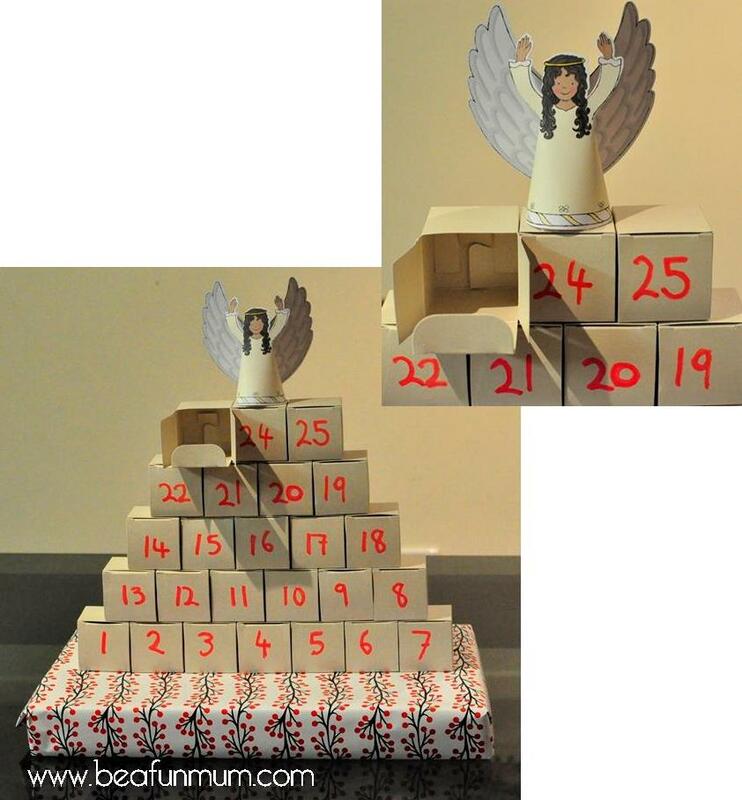 Take a look at our Advent Calendar for last year. 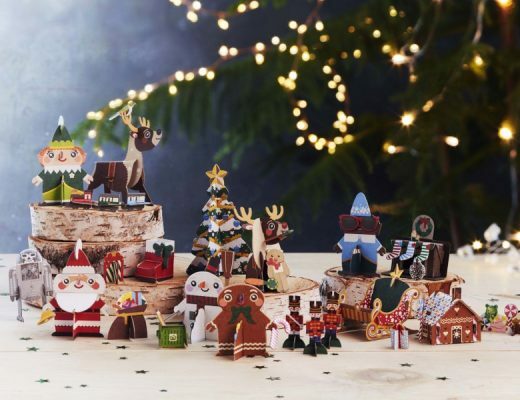 Great idea – love the Phoenix Trading giftwrap and angel as well!! All Phoenix stuff is awesome! 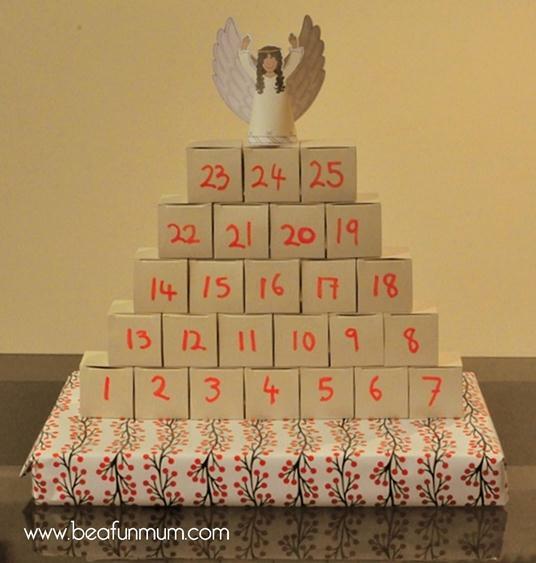 Fabulous advent calendar! Thanks for sharing, love the one from last year too! Now, which to make….mmmm. Love it! After planning to make one for the last 2 years, I cheated and bought a lovely one from Avon this year. But I am struggling to think of what to put in the boxes. Do I put in something for each child or do they take turns? Help! 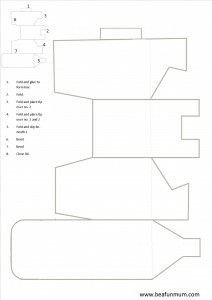 You can cut up the PDF story (above) and put that inside the box as well as a wrapped lolly or chocolate. 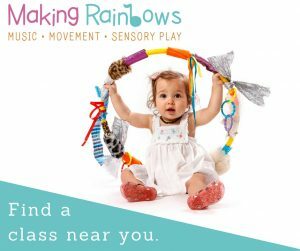 It doesn’t even have to be food, it can be a variety of small favours like a rubber, hair band, ring, rock, Christmas decoration, coin…anything that can fit. I make my kids take turns (ie. they get 1 treat every 4 days). My mum made us an quilt-type Advent Calendar which hangs on the wall with pockets for each day. For the last two years, we’ve bought a small-ish Lego City item, and then evenly divided the pieces (in order of the instructions) into the pockets. Each day, my son would pull out the pieces and slowly make the item. Rachel, LOVE the Lego idea! I’m going to do that now too! Thanks! No problem 🙂 It worked super well! I love the tradition that the advent calender creates. 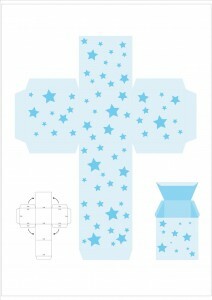 Thanks for the craft idea we have been looking for a perfect christmas craft for church. I’m personally going to use the advent story this year in our calender. I have been looking for something like that for awhile. Thanks. Hi Kelly, thanks for all the tips, i will being using your PDF, much appreciated… just a personal question, feel free to not answer if you would prefer, was just interested to know, if you and your family are Christians and attend a church, or what your beliefs are…. Of course I don’t mind! Thanks for asking. I am a Christain (and yes I do go to Church). This blog isn’t focused on my Faith but it does impact on absolutely everything I do. What I believe is the foundation for how I live my life. Feel free to email me any questions and I’d be very happy to answer them. Great minds Kelly! I’ve just been working (with help from the kids) on ours this morning. We are wrapping one Christmas book (yes, we have lots of books!) 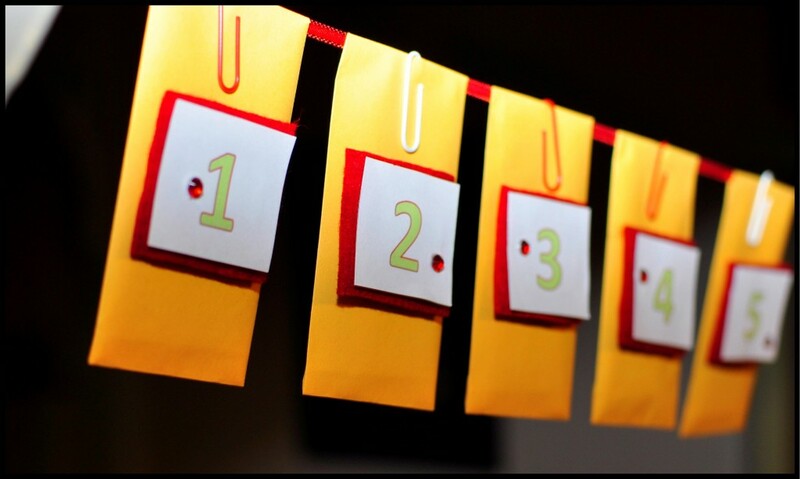 for each day from Dec1 – Dec25, then these will be numbered, labelled with a short Bible reading, questions and an activity to do, then lined up on our sideboard in order. Got the idea from something on Apartment Therapy last year (or maybe 2 years ago). Very excited! Sounds wonderful Julie! When you blog about it, email me the link and I’ll add it to the bottom of this post. I’d not thought of having an advent calendar – it wasn’t a tradition when we were growing up – but you’ve inspired me to consider one. Thanks for the template and references. You’re welcome! It’s a fun idea, and my kids don’t usually let me forget it. HA! You are definitely a “Fun Mum”, I love your ideas. Thanks. What fun the kids will have with your calendar! We’re looking forward to starting ’30 Days with Mary and Joseph’ – a book by Jo Glen. The hardback book’s two covers open to make a freestanding 19″ tableau. During each day of December, the kids will find the (reusable) sticker for that day and stick it onto the corresponding space on the tableau. In the centre, spiral-bound pages flip over, one for each day, with a reading from the nativity story, a simple meditation and a prayer. We’re also hoping to do some activities from ‘Before and After Christmas’ by Debbie Trafton O’Neal, and some others we find on the internet. We didn’t celebrate advent as I was growing up, and I am so keen to use this season to teach our kids about Jesus’ birth! For when the kids are a bit older, I’ve also got ‘The Story of Christmas’ by Carolyn Croll – a set of tiny books in a beautiful calendar, each telling part of the Christmas story, and ‘Bartholomew’s Passage’ by Arnold Ytreeide – a story that unfolds each day of advent that coincides with the birth of Jesus. Yes, I love, love, love Christmas! Ooo, loving all these books to watch out for. Thanks Lyndall! These take into account personal biomechanics and whether your foot rolls too far when running. The benefits of yoga are numerous’many still remain scientifically unknown. move the pubis backward; the abdominal muscles move the pubis forward.